Oh Instagram! It's pretty much everyone's "life" in squares... in pretty, eye-catching, picture-perfect, fomo-inducing, blogger's-world perfection... and possibly the best social media app to ever exist. Those Instagram folks are true marketing genuises. It's no secret that IG is my favorite and best performing social platform. I love it. I love it. I friggin' love it... that is all. Now, I am no expert but at my barely there 17,000 followers I know a thing or two that have worked for me and I want to share why Instagram has opened so many doors for me and my brand. Now you are probably wondering how to be successful on Instagram and I don't have a magic number or a magic formula, I am sorry. But I know that staying true, being real and honest and most importantly doing a little research and "formulas" is what has worked for me. Determining what is best and works best with my OWN readers is the key to my success on IG. Here is what I mean... when it comes to any job, what is the first thing you do when trying to master your trade? You get trained for the position, you learn the tasks and you use your new knowledge and attempt to master the trade, right? So when it comes to Instagram, this has been a key ingredient to my blogging career. Doing my homework in seeing what works best. Instagram was actually the platform where my very first PR encounter came from, opening doors to what it is today. Maria, I owe you times a million, you know who you are. So about 3-4 years ago I received and email from an Alison Brod (one of the biggest PRs in NYC) publicist, Maria Ramirez, inviting me to one of their Old Navy previews, she found me through Instagram and she was Ecuadorian, just like me! In my rookie days, I was so hungry to know it all, that I would always ask the source where and how they found me, because I wanted to know what was working for me and Maria confirmed that she found me through IG. So don't be afraid to ask questions! Be professional and polite but ask. This very first big event opened the doors and my eyes to the endless possibilities in the blogging world and what this industry has become to me. I was reading an article the other day where the headline stated that bloggers are the new models. I felt a little proud. And not because I think I am a model AT ALL, but what I took from it is what I have proclaimed to be the key to my small success as a blogger; realness. I strongly believe that the reason why bloggers are becoming so huge is because we are relatable. If you look at it from a marketing perspective, the consumer would much rather buy or try a product based on the opinion of someone they know and trust, instead of a mega superstar supermodel that they truly know nothing of. That's where I come in, and though I am not a big blogger by any means I know that my readers are loyal to my brand and trust my opinion. So much so that I have been able to make a career and build a full time business out of what was once just a hobby and Instagram has been a big piece to that puzzle for me. Here is what I can tell you about Instagram and my brand, let's call them my tips and tricks. BUILD TRUST. If you are starting a blogging business only based on the free things you get or the cool events you will be invited to, I recommend you reevaluate the reason why you are doing this. One thing I know for sure; readers/followers, they know when you are being real and they can see right through you. Building trust is #1 on this list for a reason. The reason why I am successful without having millions of readers is because my followers TRUST my opinion and believe in my word. Now gaining anyone's trust is no easy task because once you loose that you are doomed. Same goes for your business. I make sure that I am very careful in selecting business partners and accepting campaigns or projects. I only work with brands I truly admire, love and respect. So make sure you are genuine and build a trust and loyal relationship with your readers. How? Don't book projects just to book them. Be very careful in selecting partnerships, say no once in a while. And please please please do not only post sponsored content. The idea is to build a great relationship where your readers and followers understand that this is your job and you get paid for it but also that not everything you do and use is strictly because you're being paid for it, makes sense right? My readers have seen me in a variety of stages in life, they've watched my children grow, they know me and come to me for advice. I love that relationships and few friendships I've built through blogging. Trust has no ticket price. Stay true. ENGAGEMENT. While being a mom is a full time job in itself, the truth is my blog is my baby. So because I've built a brand from nothing (or hobby) I take care of it as my baby. Engaging with your followers is an essential part of blogging and replying to comments on Instagram is important. Yes, it's time consuming, but think of the time your followers are taking to be engaged in your life and your feed. I like to not only reply to comments left on my page but I also pop in their feeds as well, I want to know my readers a little and I leave comments on there too. I want them to know that I care and I take the time to check out their families and their lives too. This was a very valuable lesson I learned from my friend Daniela. Of course there are days when I don't have the time to comment back, but I make it a point to take a few minutes out of my schedule some time that week to just answer comments left on my Instagram photos. VARIETY OF STORIES. If you are already following me, which you should be;) you know that my blog and feed went from solely fashion and beauty to lifestyle and more motherhood in the past 2 years. I remember when I first started to blog I only did fashion and beauty and truthfully it got boring to me. I sat down one day and really thought hard about including my son (I only had Ben back then), I had a conversation with my husband about it and we both agreed that it would be ok to include him, since clearly he is an essential part of my life. I wanted to be relatable and as a mother, my kids are number 1, so it was a no brainer to include them in my brand. That was the beginning of my lifestyle blog and I didn't even know it yet. 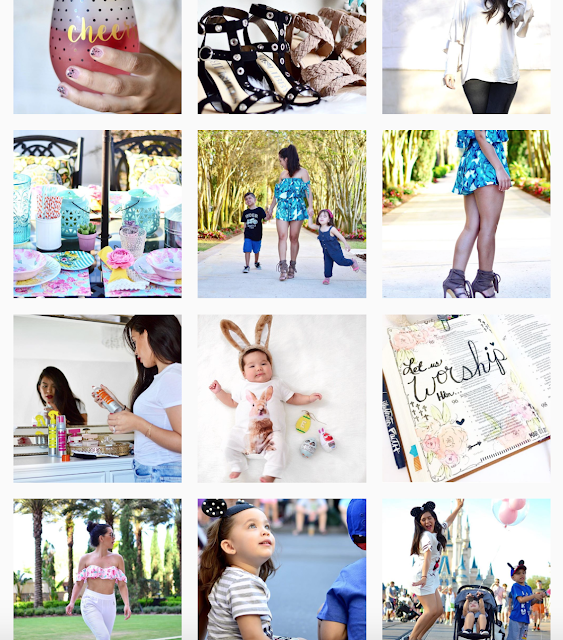 So fast forward to today, when you visit my Instagram or my blog, there is a variety of stories and photos. You can find pretty much anything on here; OOTD's as well as parenting tips, my latest beauty faves, the best places to visit in NJ, a little home decor inspiration, and as of lately a little travel too. I like to give my readers variety, fashion is my jam but let's be honest how many OOTD's and OOTN's can I show you? Mix it up and give your readers variety, see what works for you. Study it and evaluate it. USE HASHTAGS. Hashtags are important and a lot of people don't use it to their best potential. Rule #1: do not write in 20 hashtags on your caption, I normally write about 3-4 on the caption itself and the rest of them in a comment below. I have them saved in my phone on my notes by category, so I don't have to write them out every single time. So on the caption itself I will hashtag the brand or the campaign's hashtag and on the comment below I use general hashtags depending on what my photo is about. Make it relevant and use your hashtags wisely, there is a limit on the amount of hashtags you can use. Hashtags are pretty much a search engine on social media itself. So you want to be found and if the reader likes what they see they will follow so make it worth their while. Don't use silly hashtags that don't do anything for your brand, leave that for your personal IG account;) PHOTO STYLE. Now this is a tricky one because truthfully, there are days when I post an iPhone picture that does 10x better than my professional photos. But let's keep in mind likes are just a number right? Right. The idea is to create a story out of your feed, let it tell a story and have a reason behind it. I personally love bright, daylight pictures, it's just what I love and it works for me. I only use the Instagram edit options on the app itself to brighten, sharpen or contrast my photos. I don't use a filter for a cohesive look but I do keep in mind a certain aesthetic that showcases my style and taste. I never stress over an Instagram schedule or color scheme for the feed but I do like to post things that are relevant to my daily life. As a creative individual I like pretty things and I pay a lot of attention to detail. I have a mix of iPhone pics and professional pics, a little Boomerang here and a little YouTube video previews there too. I like a cohesive variety if that makes sense. But I also like to give brands a look into my style and world when they visit my Instagram page. I want them to get a feel for my sense of commitment to brands and a look into my life and my relationship with my followers. I will get into my photo edition in another post. I promise, I know you guys have been asking. ASK QUESTIONS ON YOUR CAPTIONS. Another way to get engagement is to ask questions. Use your captions not to only be fun, honest or quirky... use it to engage in conversation with your followers. So for example if we are talking about my hair (like on my latest selfie) I mention how I love dry shampoo and I asked "who is with me?". 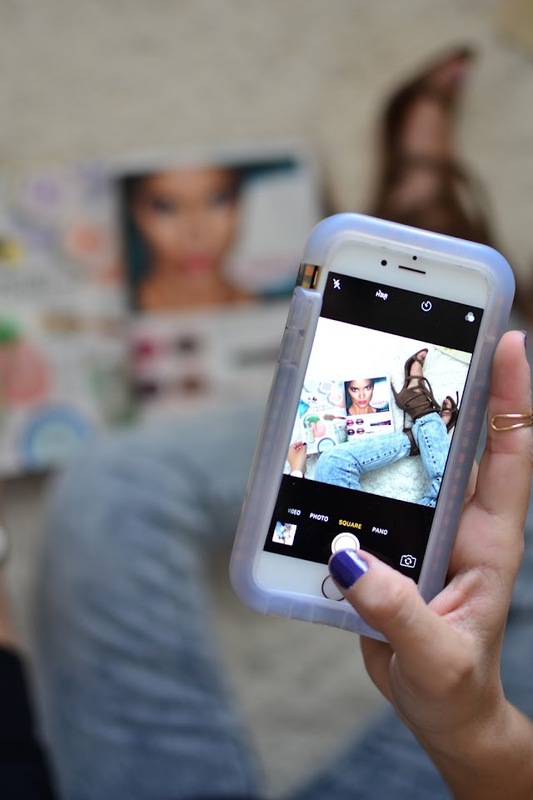 Engagement equals to movement in the Instagram feed and maybe even on the explorer page. You want that photo to move around and be seen so make sure you take the time to engage in conversation on whichever topic or story you are telling. TAG BRANDS. This one is a biggie when it comes to building business relationships. Tag the brands even if you are not being paid for it. The best that can happen is that you get a repost from a brand or company on Instagram that you love, which will lead to gaining followers; genuine, interested followers. Also use the brand's hashtags when tagging them, for example, Home Goods is #MakeHomeYours and Pier1 Imports is #Pier1Love, Forever21 is #F21xMe - these are all the hashtags the brands use to find YOU. Use them wisely. Also tag the brands on your Instagram Stories, this is the one exclusive feature that sold me 100% to Instagram stories over Snapchat. Do you know how valuable it is to be able to tag a brand on your stories as you are shopping through their store or online? Huge. It opens doors to partnerships and potential work. You are literally sending the brand a notification message and they will see it. It may start slow but getting yourself noticed is exactly the kind of attention you want. LIKES. The million dollar question. Are likes really equivalent to success? Simple answer: NO. Here's the thing, I've learned that any Instagrammer, whether you are Kim Kardashian, Selena Gomez or Camila Coelho with millions of followers... there's this percentage of people who will actually hit that like button. For example, someone like Kim Kardashian with about 98 million followers, gets about 5 million likes on a high performing photo but guess what, she is still successful. Camila Coelho has almost 6 million followers, her average picture gets between 90,000 to 150,000 likes. So do not base your photo performance on the likes it receives, yes a great "cool" photo gets more like than an "average" one but the likes don't determine the success of the blogger. Quality over anything, remember that. Great content is key. CONSISTENCY + QUALITY. I post on Instagram daily and if there is a day I don't post then I make it up and post a couple times the next few days. Learn your best hours of engagement and the times your audience is most in tune with your feed. That's another reason why Instagram has my heart; the analytics tool; it's golden and it should be your go-to source for studying your feed and your followers. Find out what your best days are and what your best posting times are and test them out. See what photos do best? Family photos, real life posts, beauty or fashion, whatever it is, do your research and post what works best for you but do not forget to post quality content not quantity content. It is very important that you do not fall into the trap of posting just to post. I've fell into that and it simply doesn't work. Be consistent with Instagram but keep in mind to post things of value and quality. Remember, Instagram is only one part of the puzzle. For me, it's a big important part of my blogging career but this blog itself is the heart of it all, here is where I go full force, full heart in with my stories and my life, so do not forget to keep this up first and foremost. For me Instagram has been a great source of inspiration as well as a door opener but my blog is my baby. My good friend Naty says it best on this piece she recently wrote, I recommend you read it too. Most importantly, stay humble and do it for the love of it. Be passionate with what you love and you will see it flourish. Thank you for sharing these awesome tips Erika. I've been blogging for two years now and while it has taken time for my blog to grow because I do work full time also, I have to be conscious of how I spend my time. I do not want to be on social media 24/7 as I also have a family. IG is definitely my biggest following thus far. I love Snapchat for silly stuff, letting my guard down, showing my followers the real me away from the computer. But I utilize IG Stories more for my blog. When I first started blogging, I didn't want to write about just one or two thing because I knew that it wouldn't be long before I was boring myself nevermind my readers. I try to mix it up between topics all while keeping it real like you said. I've only had one sponsored post so far and that's ok. I do tag brands on IG and I've gotten a couple of replies from them so far. Thank you for the IG tips and inspiration. I love your blog. Thank YOU so much for reading, I am so happy these tips are helpful to you, it means a lot to me. Honestly, keep pushing forward. I also worked a separate job when I started blogging and I would stay up late after my son went to bed just emailing people. If you want something bad, truly, you make it happen for yourself. So don't be afraid to put yourself out there.